Hello ladies happy Monday!! =) I have an absolutely stunning polish set for you which I've FINALLY had the chance to swatch. I received the polish before I left for HK but I'm so behind on everything as usual doh. Better late than never right?!! 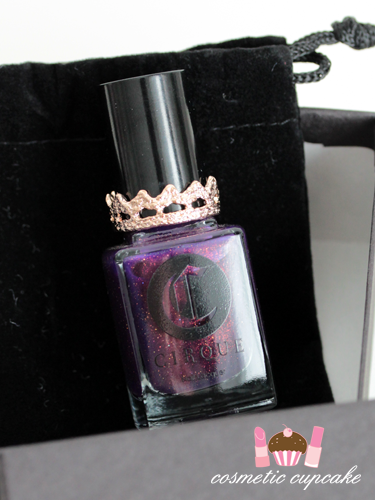 Annie Pham from Cirque Colors has collaborated with winner of Texas' Next Top Designer Jeannie Vianney to create Coronation which consists of a beautiful purple polish and a rose gold crown ring. I adore the polish and it photographs so well I couldn't resist including a whole tonne of photos so be prepared for some photo spam! 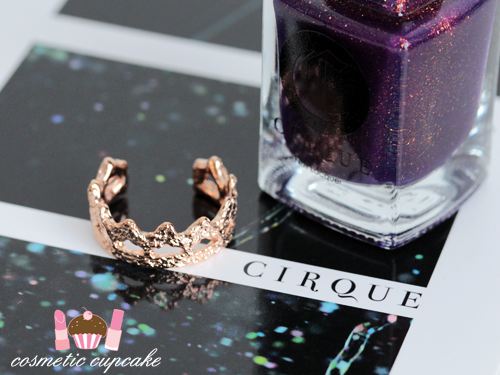 "Inspired by the resurgence of rose gold in the fashion world, award-winning jewelry designer, Jeannie Vianney, and popular indie nail brand, Cirque, have teamed up to create a special edition ring and nail polish duo. 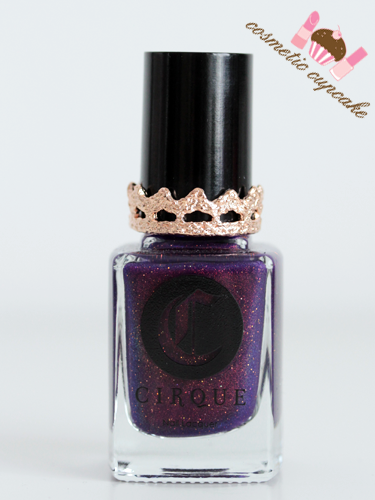 This eye-catching set exudes luxury and royalty by combining common monarchy symbols through shape and color." 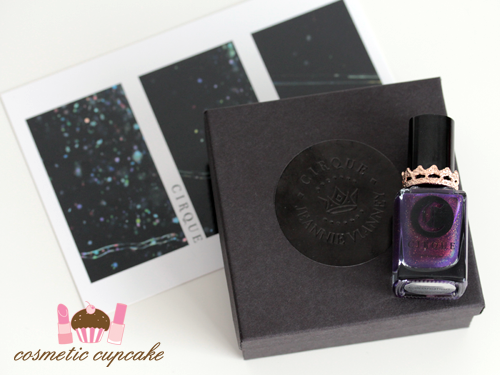 The set comes in a black gift box with Jeannie Vianney and Cirque label and inside the ring and polish are housed in a black drawstring pouch. 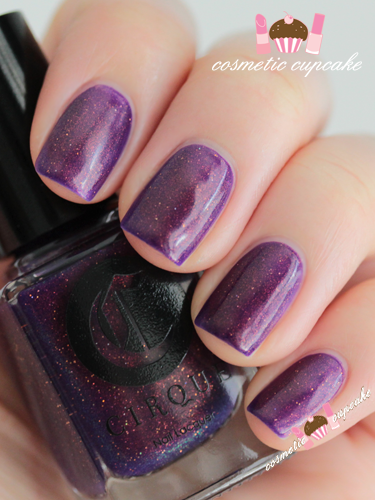 Coronation is a royal purple packed with multi-dimensional copper shimmer with a smattering of holographic glitters in a jelly base. It is just breathtaking!! 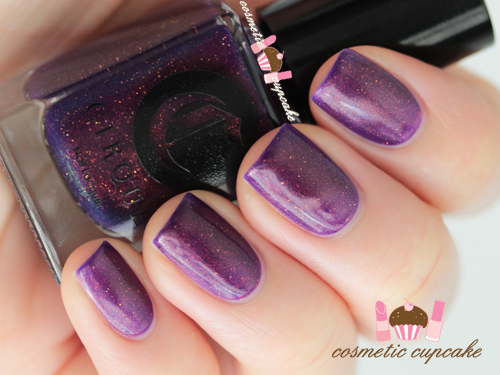 It really reminds me of Clarins 230 which is a polish I think is on every single nail bloggers wishlist!! 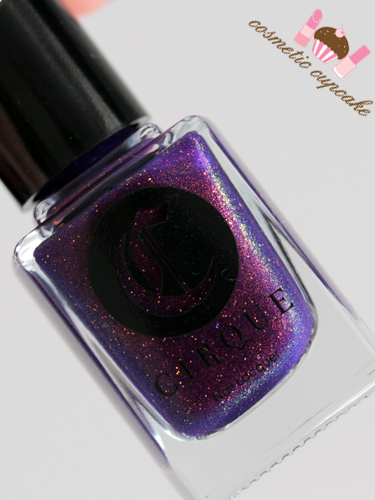 The closest shade similar to it that's actually available in stores would be Max Factor Fantasy Fire but Coronation is so much more intense and contains added glitter too. Is it not just AMAZING?? Look at that beautiful shimmer!! I don't think I could stop looking at my nails when I wore it out lol. The formula is quite sheer so I'd suggest using at least 2-3 layers for intensity or layering it over a darker shade like black or a deep purple. I found I had to be quite careful with application as it was bit patchy but if you wait a few minutes in between layers it's no problem. Don't worry it's SO worth the wait though!!! It dries quickly to a semi-matte finish and 3 coats is pictured with no topcoat - I'd recommend a glossy topcoat to really bring the shimmer out. There's a small colour shift from the pink-copper shimmer to green which is much more evident in the bottle. The set includes a gorgeous rose gold-plated crown ring which is modeled from a piece of lace cast into metal to form the crown. The size is adjustable (5-9) and it's weighty and is just beautiful! Jeannie Vianney creates her jewellery in sterling silver and gold-plate and her signature style consists of detailed lace cast jewellery. She's known for discovering vintage and lace pieces and turning them into heirloom pieces and often pairs them with semi-precious stones and pearls. Thanks for looking as always!! Oh, this is such a pretty color! That polish is gorgeous!! I'm hoping I can grab a bottle of my own when it comes back in stock. 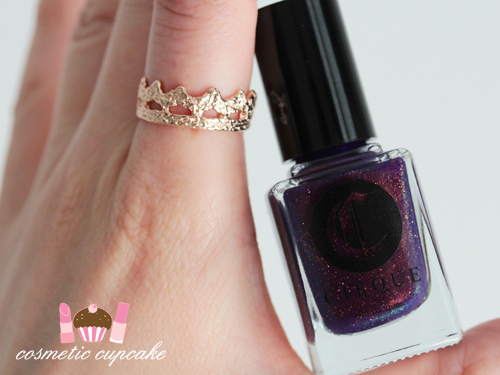 Such a beautiful shade and I love the addition of the little crown/ring! Purple and shimmer, my favourite combination!